A quick view of the most influential metrics in Time Townhomes. 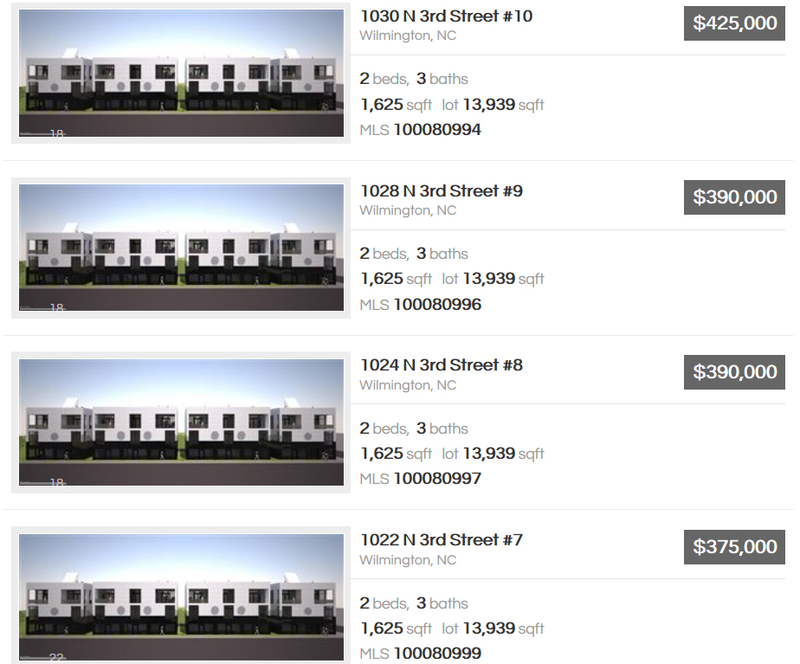 Time Townhomes is a new development located in the Brooklyn Arts District in Downtown Wilmington, NC. Time is currently under construction and will have 10 luxury properties designed by Romero Architecture. The townhomes will have concrete exteriors and feature floor-to-ceiling windows, rooftop accesses, and covered balconies with expansive views. On the ground floor of each unit will be a huge two-car garage, as well as an air conditioned studio/flex space with polished concrete flooring. Two spacious bedrooms will be located on the second floor, each with an attached bath and closet. The guest bedroom has a tub/shower combo, but the master bathroom will have a walk-in shower with black polished pebbles and a rainhead. A laundry closet conveniently sits between the two rooms. The top floor will be the main living area featuring an open floor plan, stylish kitchen with a large island, powder room, and living room with a wall of glass telescoping doors that open to the covered balcony, which also has the rooftop access. There will be chrome plumbing fixtures and luxury vinyl plank flooring throughout, as well as a tankless water heater. A long list of upgrades are available for each unit. Exterior options include additions to the rooftop area and security (window tinting and cameras). Interior features include plumbing and light fixture upgrades, built-in shelving, fireplaces, additional outlets, a car charging station, generator plug, kayak pulley station, bike racks, laundry room conversion, upgraded appliances, and more. We have the full list, if you'd like to learn more. This complex is within walking distance of Port City Marina, area restaurants and dining, and the Riverwalk. Cape Fear Community College and PPD are also right around the corner. Each townhome has a first-floor access to the sidewalk, so residents can easily make their way to nearby businesses. Contact the Cameron Team today for more information or click “Let’s Chat about Time Townhomes” above. Check out the latest demographic information available for Time Townhomes. Learn more about schools near Time Townhomes complete with ratings and contact information. Browse through the top rated businesses in the most popular categories Time Townhomes has to offer.